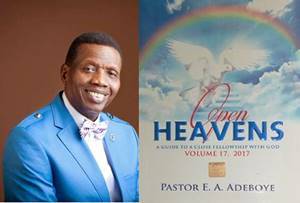 Open Heavens 4 June 2017: Sunday daily devotional by Pastor E. A. Adeboye – Vulnerable? The above scripture reveals one of the strategies that our adversary, the devil, uses to get at us: he seeks to attack and strike us when we are weary and weak. No matter how strong you are spiritually, you are still vulnerable, because every human being is limited and weak. Understanding your vulnerability and mitigating it is one of the keys to living a triumphant Christian life. When you feel weak and vulnerable, that is a good time to fast and pray. The truth is, when you are vulnerable, you are at your moment of least resistance to sin. In such moments, just a little pressure can make you fall in sin. However, being vulnerable reminds us that we were made from dust and reveals to us that we greatly need God’s help (2 Corinthians 12:9). Indeed, you are most vulnerable when you need help the most and help is nowhere near. It is during such moments that you need to go to God confessing your helplessness and asking for His help lest you fall. How does one end up in a vulnerable state? Continuous exposure to temptations can gradually weaken your defence. This is why you must avoid every appearance of evil. For example, if alcohol used to be your lord before you were saved, after accepting Christ as your Lord and Saviour, you would be wise to keep away from parties and social outings where alcohol would be served. You would also need to avoid viewing media publications promoting alcohol and sever your links with drinking pals; otherwise, if you continuously frolic around these, you will soon become vulnerable. In addition, repeatedly avoiding or neglecting spiritual tools that can build up your spiritual muscles and defences will definitely make you vulnerable. If you cannot pray, fast, study the Bible, and attend Church services with the brethren on a regular basis, you will soon become vulnerable. Similarly, if you keep bad friends or advisers, or you are a lone ranger who fails to mix, you will definitely become vulnerable. It is difficult to bend and break a broom but very easy to break a single broomstick. Before striking, the devil will usually try to isolate an individual from those who can help him or her resist temptation. This is why you need God to choose true friends for you. Lastly, failure to develop your faith spiritually will leave you vulnerable. Fortify yourself today! Action Point: Are events separating you from fellow believers as you tilt towards loneliness? Watch it! It could be another ploy of the devil to isolate and finish you off.